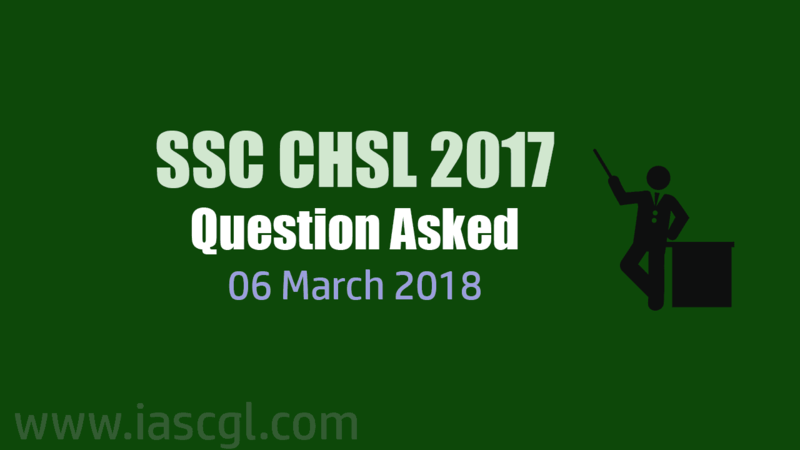 Question asked in SSC CHSL 2017 Tier I exam on 06 march 2018. Which state has the shortest coastal boundary? What is the official capital of Srilanka? Which of the planets given in option are smaller in size than earth? Who was the founder of Mughal Dynasty? Gadhwalli is the folk dance of which state? Which sentence is not related to Lord Dalhousie? Which sentence is not true about Gautam Buddha? Which of the options is the correct fact about Nylon? A question was asked on Uttam Jeevan Raksha Padak 2017-18.
Who is the first person to win gold medal in Olympic? How many lok sabha seats are there in Andhra Pradesh? One question related to force. Find the velocity of an object moving with uniform acceleration. One-word substitution for ‘lack of courage or confidence’. The idiom ‘To create Scene’. ⇒ Rajesh said he is going. ⇒ My best wishes/are with/you/no error. Find the rate of interest, if the ratio of rate and proportion is given. Find the circumference of a circle if the diameter is given. Find the inredius of the equilateral triangle. There was one question related to formula a3 – b3. If you appear in this examination and remember questions, please comment below.